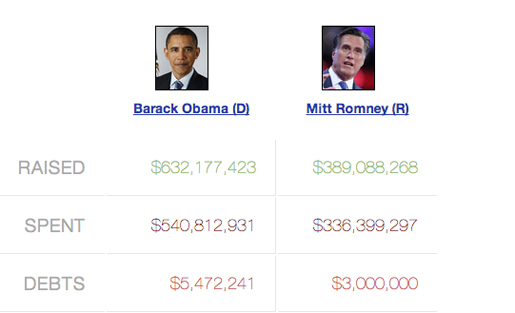 How Helpful Is All This Election Data? As the 2012 presidential campaigns intensify in the days leading up to the election, pollsters and pundits will be making frenzied attempts to grapple with the flood of information readily available on the Internet. What’s unclear is how effectively we’re using — and whether we’re being used by — that information. Let’s start with the polls. With eight entities conducting national tracking polls, a bevy of media and interest groups conducting state polls, and websites that aggregate and average poll results, we have public opinion data aplenty. But how much do these polls reflect public opinion and how much do they influence it? Are they a measure of — or a contributor to — a campaign’s momentum? In truth, they’re both. What's unclear is how effectively we're using -- and whether we're being used by -- that information." Canadian political scientist Mark Pickup has argued that voters often take cues about candidates based on media reports of polls. This “bandwagon effect,” by which voters begin to align themselves with the candidate who’s perceived as more popular in the polls, has been documented by NYU professors Vicki Morwitz and Carol Pluzinski. In their study of the 1992 presidential election, Morwitz and Pluzinski demonstrated that political polls change not just voters’ expectations of who will win the election but, in some cases, their preference for a certain candidate. The real test in determining whether we use public opinion polls or the polls use us is to answer the perennial question, “who benefits?” There’s no question that campaigns use polls as an informative tool to help them calibrate and recalibrate their strategies, and that mainstream media organizations use polls as a leader board for maintaining the high drama of their horse race coverage. But the jury is still out on whether they’re useful to the everyday voter, who’s got limited time and information, and is more interested in sorting out her or his preference than knowing and analyzing the entire country’s preferences. Fundraising data: Does it matter? There’s also more publicly available fundraising information than ever. 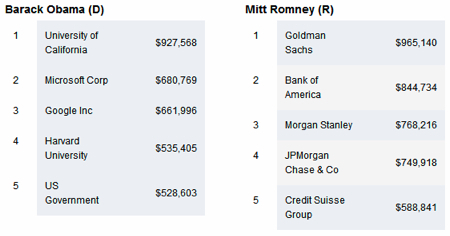 We have data on who has donated to which campaigns (employees of Microsoft, Google, the University of California and Harvard University are giving to President Barack Obama while folks over at Goldman Sachs, Bank of America and Morgan Stanley are among Mitt Romney’s top backers). And new data shows how people are making donations — according to a Pew study released last week, Republican donors are more likely to make donations by mail and in-person, while Democrats are more likely to contribute online or via email (and are nearly three times as likely as Republicans to donate via text message). Sure, there are interesting inferences to be made with information like this. It reinforces the narrative that Democratic donors are more tech-savvy and many Republican donors hail from the finance world. But fundraising data and trends are also being used to identify and target prospective donors in new and aggressive ways. And opponents to certain candidates can easily assemble, from FEC data posted online, a roster of that candidate’s donors and even conduct online opposition research on those donors. Every time you type a political query into a search engine, you may be retrieving information, but you’re also contributing bits of information to a large pool of online data that’s being exploited by campaigns, journalists and academics. According to data from Brand Yourself, the SEO company, nearly a third of adults who have queried a person’s name online, have looked up the name of a candidate for office. More than half of those people have found information that influenced them to vote for a candidate, and more than half have found negative information that led them to vote against that candidate. So, yes, the Internet is indeed a useful, new reference with information that can help voters decide. But just the fact that search trends like these are available allows campaigns to adjust their strategies and tailor their messages. When, for example, political scientists are showing that people are querying words like “vote” on Google less frequently than they did four years ago, pundits begin to predict lower turnout and campaigns will ramp up their “get out the vote” operations. An article in this Sunday’s New York Times brought to light the extent to which this datamining and microtargeting is occurring. The article reports that the Obama and Romney campaigns are deploying increasingly sophisticated tracking tactics, with BarackObama.com hosting 76 different tracking programs and MittRomney.com hosting 40 of them. Both of these figures are up about 50 percent from the number of tracking programs found on these two sites in May. The Times got its data from Evidon, a “company that helps businesses and consumers monitor and control third-party tracking software” (in other words, a company that tracks the trackers). While consumer advocates worry that data on millions of Americans’ political beliefs could fall into the wrong hands, both campaigns have made assurances that their vendors — companies with names like “AdRoll” and “ValueClick” — will protect the privacy of their web visitors. There’s nothing wrong with this two-way use of information, per se, and as an academic, I’ve been able to troll social media sites like Facebook and Twitter for huge data sets that help me understand public sentiment and political opinion. But it’s important to know this is happening. The examples I used (for opinion polling, fundraising data and web-tracking activity) are just the tip of the information iceberg. I attended an event last week where Stanford political scientist Shanto Iyengar discussed the campaigns’ use of web analytics to anticipate individuals’ partisan affiliation by their web-surfing behavior. He didn’t take a position on whether this was necessarily good or bad, but he concluded by saying, “One can imagine an Orwellian world where a politician knows everything he needs to know about his audience and therefore can just tailor his positions and his message to get the votes needed to win.” The cynic might suggest that this is already how many of our professional politicians operate. If so, the tricks of that trade are getting trickier.